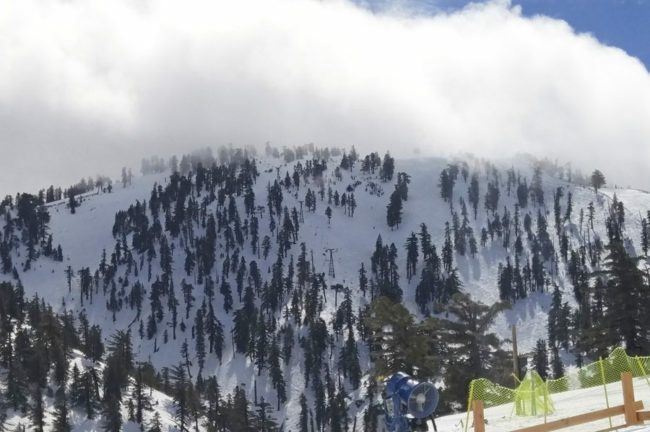 Mount Baldy is just one of those escapes that shouldn’t be this close. People associate Los Angeles with our beaches and desert climate, but the fact that you can be immersed in an alpine environment in about an hour’s drive will dumbfound anyone from outside the region. I always hail Mount Baldy from a cycling perspective, but recently visiting with other activities in mind just adds to the area’s outlook. 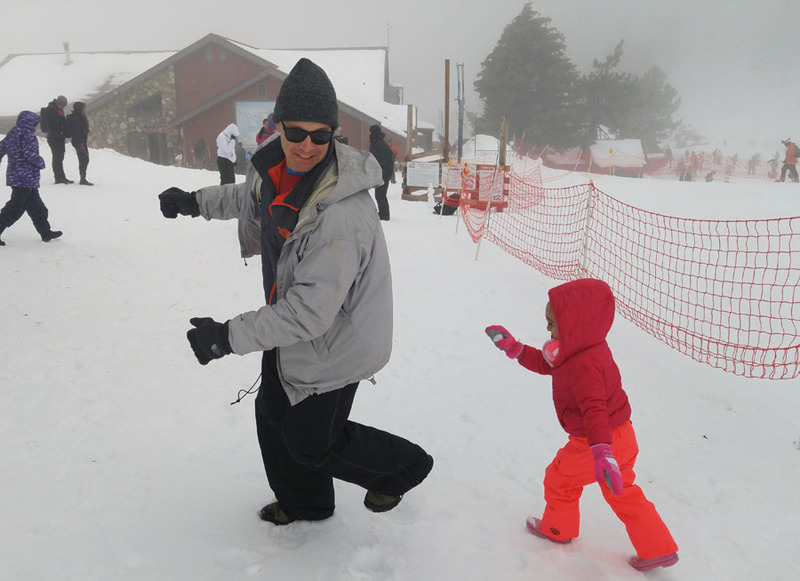 For the past couple of years, I have been on a Griswoldesque quest to get my daughter to snow. We did take her to Beeman Park a couple of years ago when they dumped a couple of tons onto the grass, but after a couple of hundred people had pounced on it, the snow felt more like an uneven skating rink. Our original plans this past President’s Day Weekend were nixed because of the rainstorms up north, so with a clean slate of having no plans, I was determined to be snowbound. 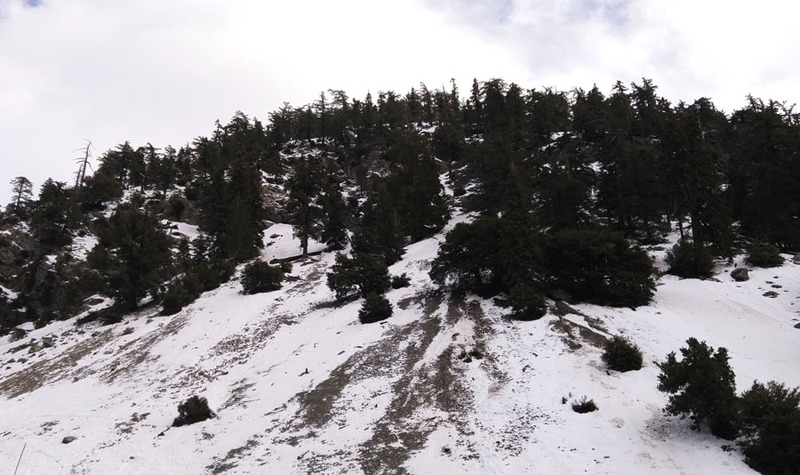 Originally, I was looking to go to Wrightwood because one of my friends was out there with his family. Our goal was to hit the tubing park, but his advice was to get there super early, because sessions fill up fast. Even then, he said they were able to only do three runs between all the crowds. Hmmm. Did I really want to drive out an hour and a half for that? 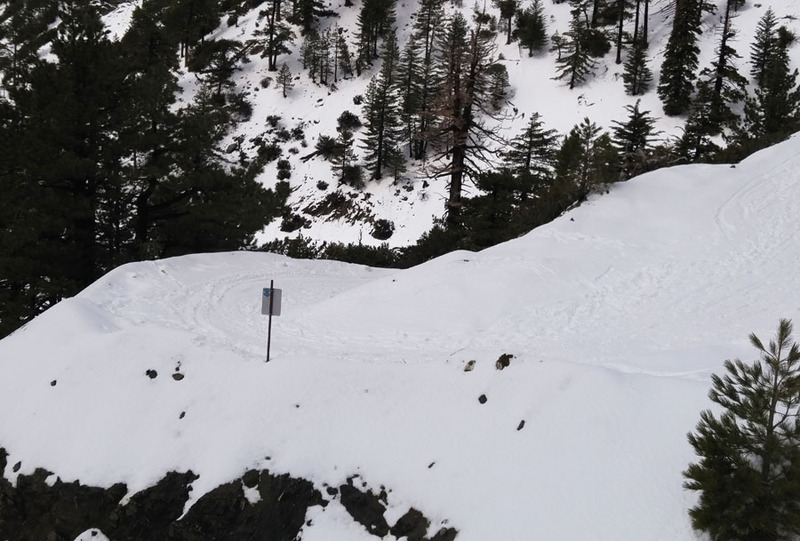 Mount Baldy was a bit more of a risk since I didn’t have any firsthand information, but at the very least, we could ride the ski lift, so off we went. We ended up going on the Monday, which probably was the lightest day of the weekend. 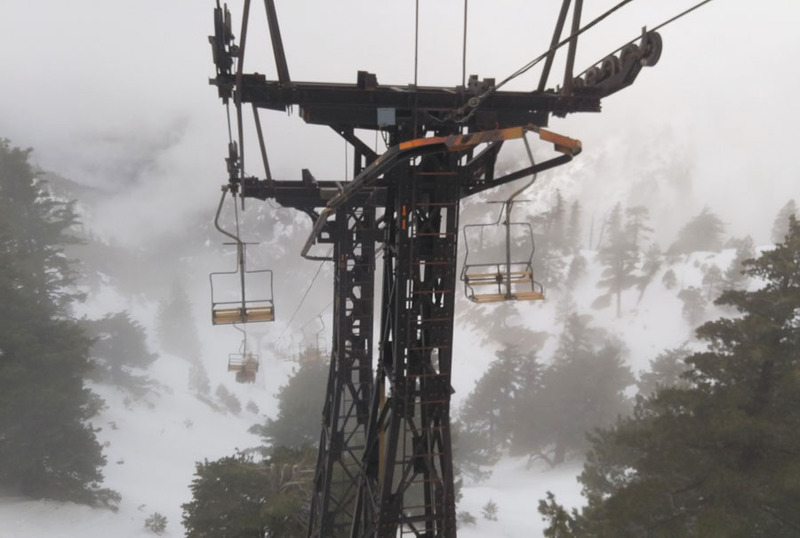 How perilous do the ski lifts look? I had thought about purchasing tickets ahead of time, which is at a discounted rate, but was worried about cashing in our tubing tickets if the space filled up early. The wife and I got up at 6 a.m. and was surprised how cheery CV Jr. was to be woken up a half hour later, but telling her we were going to snow had a lot to do with that. On the drive up Mt. Baldy Road, I thought about turning on my Strava just to freak Phil Gaimon out, since he’s been prepping to take a few KOM’s up here. Little did I know that he was ten minutes behind me targeting the lower segments of the road. I regret not doing this now. The CV family mystery van arrived at the Mt. Baldy Ski Lift parking lot at 8:25 a.m. able to grab a spot pretty close to the ticket booth. Getting CVJr’s snow clothes on took awhile which meant I was burning what little fuel our car had left to keep us warm (Pro tip: don’t do that). 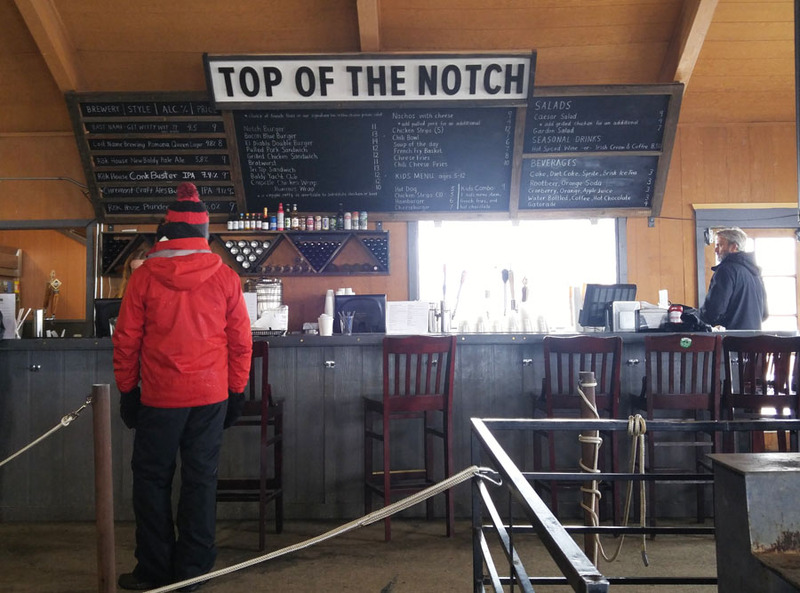 I got to the cashier’s window by 8:45 a.m, and while we could still make the 8:30 – 10:00 tubing session, we opted to do the next one at 10:30 to get our full 90 minutes in. Riding the ski lift was the part I was most nervous about. Never had my daughter dealt with heights before, so ten minutes of being strapped in is a long time to deal with a crying child. Luckily, the opposite happened and she was so overjoyed, we could have just turned back and called it a successful day. I could also note under the snow that there was probably a dirt road that winds up the mountain. I’m keeping that in mind for the summer. Reaching the top, we quickly surveyed the mountain locating the tubing park and multiple ski lifts, but opted to headed indoors to the Top of the Notch restaurant since CV Jr. didn’t really eat breakfast. We ordered at the bar, which really tempted me to try one of their good selection of local beers off their taps. Surprisingly, two kegs were tapped out ten minutes later.. The price for food was reasonable, especially considering there were no other choices and we took our time before heading out to the snow. 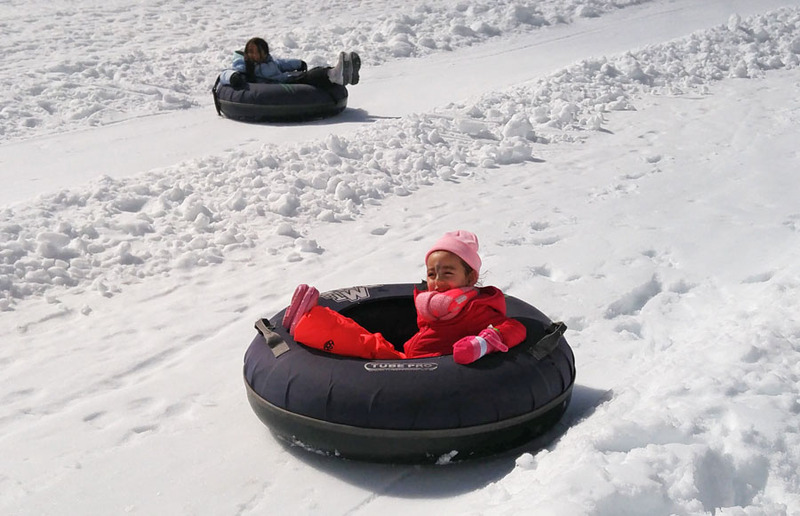 We had about a half hour before our tubing session started, so we started playing in the snow. CV Jr. loved creating snow men, running around and making sure to throw snowballs at my back. I’m not going to outrun this girl. The clouds started to life a little bit too revealing the tons of powder still above us even though we were already at 7,800 feet. When the tubing park opened, there were about twenty five people in line to go down two chutes. The line moved fast, but the biggest caveat was having to walk back up dragging your tube back up with you. This four year old needs no help! CV Jr. first went with mom, then me a couple of times, then went solo twice before calling it. We took another restroom break and got back on the ski lifts down. It looked like there was enough snow to ski all the way back down except for a small exposed surface near the bottom. Once again, CV Jr. had a blast waving to other people on their way up. 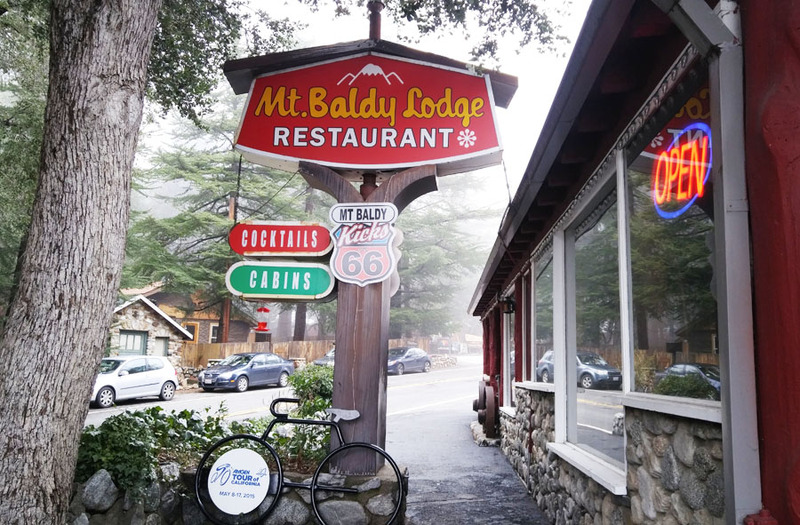 We quickly through on some dry clothes and headed down the mountain to Mount Baldy Lodge for some lunch. For all the times I’ve stopped for water (which they have a free dispenser outside), it was about time I returned the favor and ate there. The Tour of California bike is reason enough to visit. It was seat yourself and our server came over expeditiously to take our orders which did include beer this time. The food was priced what you expected and we were pretty relaxed just enjoying the atmosphere. We started heading home at 1 o’clock, but it felt like we had a full day of experiences. Mt. Baldy isn’t just a place to experience as a cyclist, but for anyone who visits.